Here is the task: several users need to watch a video on YouTube simultaneously, with latency as low as possible. Apparently, if each of spectators just starts playing a video, the stated goal cannot be achieved, because one user will receive the video faster, will the other will get it slower. And this gap is hardly controllable. In order to eliminate this divergence, the video should be delivered to all spectators simultaneously. This can be achieved by enveloping the video to a Live-stream. Below is the description of how you can do this using a tandem of this library with ffmpeg. We need to implement the diagram presented above. Specifically, ydl connects to YouTube and starts downloading the video. ffmpeg grabs the video being downloaded, envelops it to an RTMP stream and sends to the server. The server broadcasts the received stream as WebRTC in real time. First of all, we install youtube-dl. The installation process on Linux is extremely simple and is described thoroughly in Readme for Linux and for Win. That’s it. YouTube downloader is ready for work. Now, the most interesting part. The youtube-dl library is intended for downloading. That’s where the name comes from. This means you can download a YouTube video completely and then stream it via ffmpeg as a file. But imagine this use case first. A web conference with three participants: a marketer, a manager and a programmer. The marketer decides to play a video from Youtube in real time to other conference participants. The video is 300 Mbs, and that’s a little bit embarrassing. The marketer says: “Now, buys let’s watch this pussycat video as it precisely displays our marketing strategy” and clicks “Share the video”. A preloader appears on the screen saying something like “The pussycat video is being downloaded now. This will take less than 10 minutes”. The manager takes a coffee break, and the programmer goes to reddit. Apparently, asking people to wait is bad for business, so we need real-time. Specifically, we need to grab the video directly while playing, encapsulate it to a stream on the fly and broadcast it in real time. Below is how this can be done. The youtube-dl grabber saves the stream in the file system. We need to connect to this stream and read from the file using ffmpeg while youtube-dl keeps downloading new chunks. To merge these two processes – downloading and ffmpeg streaming – together, we need a simple script. 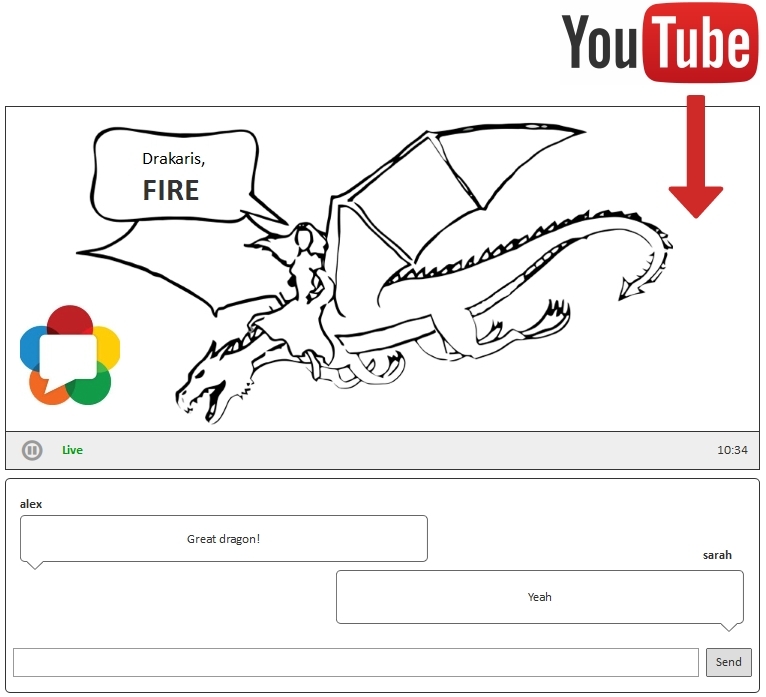 Creates a subprocess named _youtube_process that reads the video using the youtube-dl library. Creates a second subprocess named _ffmpeg_process that receives data from the first one via pipe. This process creates an RTMP stream and sends it to the server at the specified address. To run the script we need to install python. Download Python here. We used version 2.6.6 for testing. Most likely any version will do, because the script is simple enough with just one goal – to send data from one process to another. For testing, we use Web Call Server. It can receive RTMP streams and broadcast them via WebRTC. Here you can download and install WCS5 on your own VPS or local testing Linux server. This is the RTMP address we need to pass to the streamer.py script to quickly test broadcasting using the demo server. handler_name    : ISO Media file produced by Google Inc.
A page with the video is opened. Video format data is extracted. ffmpeg runs, grabs the downloaded data and starts RTMP streaming at 421 kbps. Such low bitrate is explained by the chosen video – a simple timer. A more typical video would produce much higher bitrate. After streaming starts, we try to play the stream in WebRTC-player. The name of the stream is specified in the Stream field, and the address of the server is in the Server field. Connection to the server is established via Websocket (wss), and the stream is received by the player as WebRTC (UDP). We used this specific video from YouTube intentionally, to demonstrate the real-time nature of the stream. Indeed, our goal was to deliver a YouTube video to all spectators simultaneously with minimum latency and time spread. This millisecond timer video supremely well fits for this test. As you can see, each spectator watches the same video with time divergence of no more than 130 milliseconds. Hence, the goal of real-time broadcasting of a YouTube video as WebRTC is solved successfully. Spectators receive the video almost simultaneously. The manager didn’t have to go for coffee, the programmer had no time to read reddit, and the marketer managed to display the pussycat video to everyone. streamer.py – the script to integrate youtube-dl and ffmpeg followed by RTMP stream sending.